Yesterday there was another doom and gloom essay published in the mass media with regards to the Canadian housing bubble. 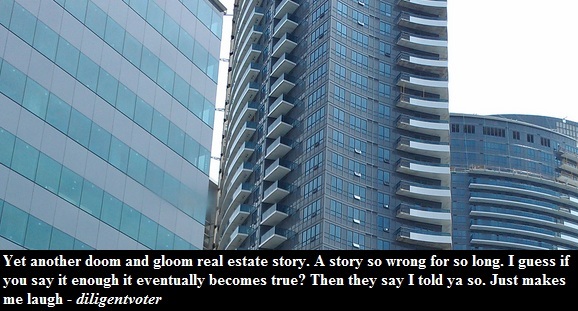 Many comments on the article were of the same tone as the quote above - bubble mongering has been happening since 2008, yet nothing has happened and real estate prices keep going up. At first glance the above statement makes total sense, but there are two things that you need to realize. Firstly, bubble mongering is happening for a reason. Home prices have risen faster than incomes for over a decade now. This is simply unsustainable. Secondly, the emergency low interest rates artificially boosted the affordability of Canadian housing which prolonged the lifespan of the bubble. So just because the bubble hasn't deflated yet, doesn't mean that it isn't real. Also, when the real estate bubble finally does deflate, it will be because housing was out of whack with fundamentals and not because of a self fulfilling prophecy. Now back to that article with my comments and added graphics. Housing in Canada is unaffordable. International experts are unequivocal in their concern, and Canadian lawmakers are taking measures to deflate slowly rather than crash. Ironically, only Canadian homebuyers seem to think the market is sustainable. Sale prices are still rising. So when does it all start to unwind? Right about now. Since the Great Recession, the Canadian economic model has basked in international reverence for its conservative banks and rich commodity sector. So when Wall Street rumblings about a Canadian housing bubble started becoming louder about a year ago, as a card-carrying Canadian, I took notice. Over the last year, the “short Canada” thesis on Wall Street has evolved from a contrarian sidebar into a growing chorus. The Economist recently wrote that Canadian housing looks “particularly vulnerable” because of unsustainably high home prices compared to rents and incomes. The OECD expressed the same concern. Steve Eisman, a private investor profiled in The Big Short for shorting the U.S. housing market, recently presented several ways to short Canada. Even Paul Krugman, a fan of Canada’s economic and political backbone, recently published his concerns about Canadian home prices and household debt. Canadian lawmakers and institutional stakeholders have taken notice and are positioning themselves defensively. The finance minister, the Bank of Canada and CMHC have tightened and continue to tighten lending standards to “cool” the housing market. CIBC shuttered its mortgage broker lending arm, FirstLine, and is considering selling its mortgage broker franchisor, Mortgage Center Canada. Those closest to the industry are pulling back on the reins. Coincidence? · Home prices are so high relative to incomes that average households are very vulnerable to rate or income movements. · Housing is such a big part of the Canadian economy that any small shift can be problematic. In Toronto, the median income is around $73,000, according to Demographia. The median home price is $455,000. After coming up with a 20-per-cent down payment, a “median” mortgagor would be on the hook for $22,200 annually, even at a 3.5-per-cent mortgage rate (which has to go up). If we include other housing costs (real estate taxes, maintenance, insurance, etc. ), costs climb to $30,000 every year. Throw in cable, cellphones, groceries and Internet, and the family budget gets quite thin, quite fast. What happens when rates hit 5 per cent, or 8 per cent? 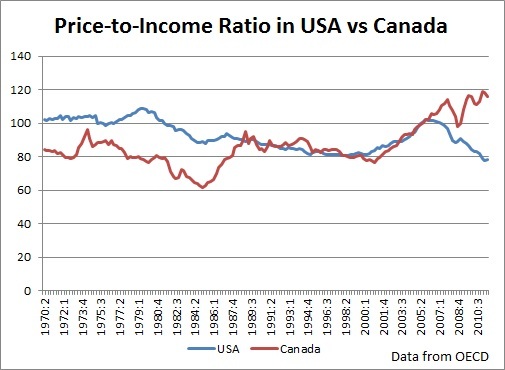 My gravest concern is that Canada is fast approaching a 5:1 home-price-to-income ratio, a benchmark achieved by the U.S. at the peak in 2006. Since the correction, the U.S. ratio now hovers at approximately 3:1. To compound the problem, household debt in Canada has breached 150 per cent of income and continues in the wrong direction; households are not cushioned against a blow. According to Demographia, the median multiple in Toronto was 5.9 in 2012 which is considered severely unaffordable. Additionally, the debt-to-income ratio is currently 161.8% The future is indeed grim for the Canadian housing market.